Karsun Designs: "Alvin and the Chipmunks: The Squeakquel"
The "Alvin and the Chipmunks: The Squeakquel" DVD is ready to watch! It’s available on DVD, Blu-ray and Digital Download and you can buy it now. 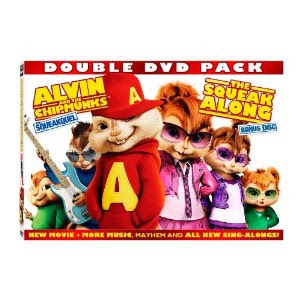 There’s even a double DVD set that has "The Squeak Along" Bonus Disc, with more music, fun and all-new singalongs. Visit Fox for More Munk Mayhem for everyone. So this would be a great addition to anyone’s collection, especially if you have kids. It’s family friendly and something you can share memories about.